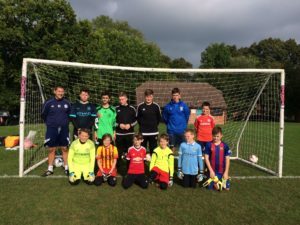 Worplesdon Rangers Football Club » Calling All ‘Keepers! Club Launches Second Woking FC Goalkeeper Coaching Clinic Next Month…. Calling All ‘Keepers! Club Launches Second Woking FC Goalkeeper Coaching Clinic Next Month…. Following the success of last year’s goalkeeper coaching clinic run by Woking FC Football In the Community (WFITC), the Club is pleased to announce that a second session is scheduled, planned for Saturday 11th February 2017. Exact timings for the morning have yet to be agreed and will depend on uptake across the Club. The venue for this event will once again be Cardwells Keep. Each team in the Club is encouraged to nominate up to two players who they think would benefit from this clinic. They can be existing or reserve goalkeepers. Please forward your nominations to Sean Crooke, Club Development Officer at sean.crooke@wrfc.club, or call him for an informal discussion about the session on 07774 494939.